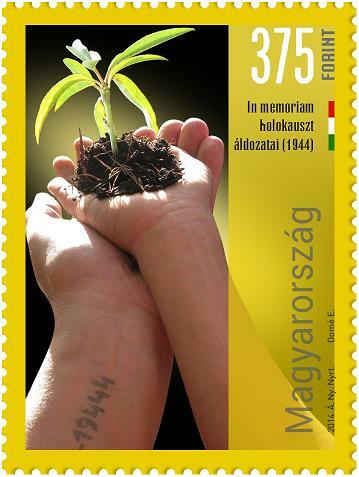 The Hungarian Post had issued a stamp to commemorate victims of the Holocaust on the 28th of April, 2014. The symbolic wording thumbnail next to the remembrance of the victims and the revival message of rebirth. The stamp is based on the design of Esther Dom graphic artist stamp and manufactured by ANY Security Printing. The memorial stamp is available at the larger post offices and can be ordered through the Fila-Posta – Philately-Post Stores. Also may order from the web site of the Hungarian Post on the online stores. The stamp’s printing method stands in 4 color offset printing and is perforateD having the size of: 30×40 mms. The price of a stamp is 375HUF. “Between 1941 and 1945 more than 400,000 Hungarians were victims of forced labor, the deportations, the brutality, the death march for the mass executions and concentration camps. The Holocaust was one in ten, the largest Nazi death camp, Auschwitz-Birkenau every third victim of a Hungarian citizen. March, 19 1944. Hungary was occupied by the German army. The first step was to complete the legal separation of the Jews in Christian society the way, followed by concentration to larger cities, and in the last phase transport. A first set of measures in the government session held on March, 29. 1944., was adopted. A total of about one hundred limited rights regulation. Released in April, 28. 1944., 1610 / 1944th ME Case, on government regulation, the so-called. “Ghetto-regulation”, which governs certain matters related to the Jewish home and the residence of the appointment the same day. About the mass deportations starting in mid-May as a first step – started first with more than 1800 people death train from Kistarcsa to Auschwitz and mid April. Between the end of May almost the entire Jewish population of the country was closed to ghettos and concentration camps, and about 430 thousand people were deported between May, 15 and July, 9 in the context of the Holocaust biggest deportation operation.” Source from wikipedia.org.